During the month of April, enjoy the various events and performances of Voices of Spring. Join us for a month of joyous voices and wonderful music, including composers such as Ola Gjelio and Eriks Esenvalds, and ensembles such as the Saint Paul Chamber Orchestra and the Eric Whitacre Singers. 7 a.m. — Wachet auf: Peppy choral works to help you wake up. 9 a.m. — Opera Voices: Opera tracks selected by Minnesota Opera artistic director, Dale Johnson. 11 a.m. — Masterworks: An excerpt of a choral masterwork. Hear the complete work at noon on the Choral Stream. 3 p.m. — Land of 10,000 Choirs: Selections from regional choirs, curated by Steve Staruch. 5 p.m. — Song of the Day: A daily art song chosen by award-winning Twin Cities mezzo-soprano Clara Osowski. 7 p.m. — Modern Voices: Each week we highlight the works of a living choral composer. 9 p.m. — Quiet Voices: A soothing piece to help you unwind. Join us all month long on the Choral Stream for handpicked music and conversation with our main choir geek, Brian Newhouse, joined by one of the conductors, composers, singers, entrepreneurs or mover-shakers making choral music so exciting today. Classical MPR is giving away one Choral Stream tote bag on air every weekday in April. You also can get a Choral Stream tote bag by becoming a member for $5 a month. Click here to donate. Click here to enter for a chance to win the Voices of Spring Prize Pack! It includes a limited-edition Choral Stream tote bag, choral CDs, a pair of tickets to the Minnesota Opera's production of Thais on May 15 and a pair of tickets to see Cantus and its Covers - Pop Concert on June 1. Enter by April 30. Do you love to sing? Classical MPR seeks voices of all abilities for Bring the Sing, a community singing event that is part choral workshop, part recording session. Whether you're a professional vocalist, a choir member, or just like to sing in the shower, you're invited to join the fun of choral singing! You'll work with conductors, sing with members of your community and others around the state, and hear the result posted on classicalmpr.org. 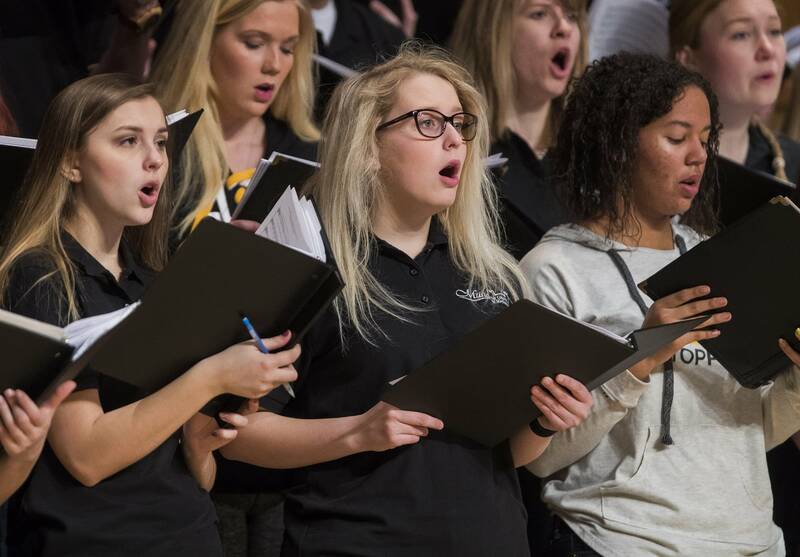 Registration is now open for Bring the Sing Decorah, scheduled for 10 a.m.-2 p.m. Saturday, April 14, in the Center for Faith and Life performance hall at Luther College, 700 College Dr., Decorah, Iowa.